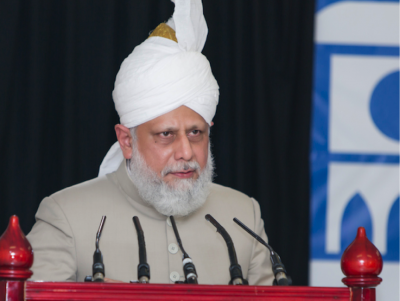 On 23rd October 2013, the worldwide Head of the Ahmadiyya Muslim Jama’at and Fifth Khalifah, Hazrat Mirza Masroor Ahmad (aa) delivered the keynote address at a special reception held to mark the opening of the Masroor Mosque in Brisbane, which was later formally inaugurated with the Friday Sermon. Various non-Ahmadi dignitaries and guests, including Members of Parliament and Queensland’s Commissioner of Police, attended the event. Numerous dignitaries also addressed the audience. Today is a day of great joy and a cause of celebration for the Ahmadiyya Muslim Community Australia here in Brisbane, as it is inaugurating its first ever mosque in this area. A mosque holds huge significance and importance to any true Muslim. However, before I go on to speak about this, I would like to first of all express my heartfelt gratitude to all of our guests who have come to attend this inauguration, and so are sharing in the happiness of the Ahmadiyya Community. For all of you to attend the inauguration of a place of worship belonging to a Muslim organisation, in spite of not being associated to Islam, or not being a member of the Community, is a sign of your open-minds, tolerance and high moral standards. In light of this, however much I thank you is not enough. In reality, the very concept of “gratitude” is actually a means of fulfilling the purpose for which this mosque was built and of fulfilling its rights. It is necessary for a true Muslim, who believes that his life’s purpose is to please God, to act in a way through which he can gain God’s pleasure. Certainly, to express appreciation and thanks is one of the ways to please God and to make a person a recipient of His rewards and blessings. God Almighty has very clearly stated in the Qur’an that if a person is grateful to Him, He will bestow further bounties upon that person. According to our beliefs, the Holy Qur’an, which was revealed to the Holy Prophet Muhammad (s.a) , is the final law-bearing Book and it was he who understood God’s teachings best of all. Certainly, he had the greatest knowledge and insight of the Qur’an and it was he who clearly explained the importance of gratitude. He taught that a person who does not thank mankind, cannot be grateful to God Almighty. And so, whilst on one level this teaching of expressing thanks and being grateful guides a person towards high moral values, it also takes a true Muslim towards attaining nearness to God. In light of this, whilst the opening of this mosque inspires us to thank Allah for blessing us with a place of worship in this area after a long wait, at the same time it also inspires us to be grateful to all of you who have joined us to take part in our celebration and to share in our joy. Further, whilst availing this opportunity, I would also like to thank all of the local people who have greatly helped and assisted us in the construction of this mosque. The people who live locally are particularly deserving of our thanks, because if our new neighbours had not given their consent, we would not have been able to build this mosque. And so I thank you all. I would also like to thank members of the local Council and the Mayor for providing us with a place to build our mosque so we can join together to worship the One God. Certainly, the worship of God holds the utmost significance and importance to a true Muslim. Whilst, according to God’s command, a very major objective for any Muslim is to bow down in prayer before his Lord five times a day, this is only one aspect of worship. In fact, for any true Muslim, worshipping God is something that is truly vast in scope and comprises much more than the obligatory prayers. We, Ahmadi Muslims, believe the Founder of the Ahmadiyya Muslim Community, Hazrat Mirza Ghulam Ahmad (a.s) of Qadian, to be the Promised Messiah and Imam Mahdi – the Guided One of this age. We believe that he was sent in this era by God Almighty to propagate the true teachings of the Holy Prophet Muhammad (s.a) . And so the Promised Messiah (a.s.) clearly explained the concept of worship to us and he elucidated upon its true significance and reality. Let me give a few examples that highlight the true nature of worship. A Muslim has been commanded to treat his wife with kindness and love, and to not covet or cast his eyes upon her wealth or property. It may be the case that a man is very regular in going to the mosque to offer his prayers, yet in his home he does not treat his wife with love and tenderness as commanded by God. The truth is that, in such a case, his worship and prayers are rendered entirely meaningless. Indeed, God Almighty greatly dislikes such worship and such worshippers. Furthermore, Islam commands Muslims to treat their parents with love and consideration, and so if they fail to do so, then their prayers are again entirely without value. God Almighty has further ordered Muslims to fulfill the rights of mankind, to serve humanity and to always be just. If a person fails to uphold these necessary values in his daily life, yet comes to the mosque regularly, his worship will become void and a cause of despair. Indeed, God Almighty has said that the prayers of a person who does not follow His commands will prove to be a means of destruction for him. Thus, true worship requires fulfilling the rights of mankind in an entirely selfless manner. The rights of others should be discharged purely for the sake of attaining God’s pleasure. When a person acts in this way and with this spirit, he will find that God will consider not only his prayers to be worship, but will deem his every single good act to be a form of worship. Therefore, it is clear for all to see just how beautiful these teachings really are. So many avenues of success and worship have been created for those people who abide by God’s commands. Whoever comes to the mosque to worship God, in other words a true Muslim who enters the Mosque five times daily to bow down before His Lord, should constantly analyse himself. He should ask himself how many acts of goodness and compassion he has performed in the period between each prayer, for the sake of fulfilling the rights owed to God’s Creation. If a person does not fulfil the rights due to mankind, then, as I have already said, his worship is worthless. Thus, this is the reality of a mosque and this is the reality of the worship of a true Muslim. And so, those people who hold any reservations about the construction of this mosque, or who are concerned by the potential impact of having a Muslim place of worship in this area, should be reassured. Similarly, if there are any people who are concerned that those who live near the mosque will be disturbed in any way, or who think that this mosque is something for the local people to fear, they too should rest easy in the knowledge that this will not be the case. All such people should remember that the Ahmadiyya Muslim Community is an entirely peaceful organisation which strives to follow the true and compassionate teachings of Islam. In our mosques when the call to prayer is raised calling Muslims towards the worship of God, one of the key proclamations is that they are called towards prosperity; meaning they are invited towards success and happiness. The Qur’an has said that only those people attain true success and salvation who call people towards goodness and who prevent or stop wrongdoing. In detailing what is right and what is wrong, Allah the Almighty has placed great emphasis on fulfilling the due rights of mankind and of caring for one another. In fact, God says that true contentment can only be achieved by those people who give preference to the needs of others over their own. Thus, from every possible perspective the worship of God is intrinsically linked and interwoven with fulfilling the rights of mankind. This bond is so strong that if they are ever separated, man cannot fulfill the purpose for which God created him. The Ahmadiyya Muslim Community endeavours to serve mankind throughout the world due to its love for humanity. Thus, it is carrying out various humanitarian and educational projects in an effort to help poor and deprived people irrespective of religion, creed or colour in various parts of the world. Our sole motivation and guiding light are the real teachings of the Qur’an that have been explained to us in this era by the Founder of the Ahmadiyya Community, – the Promised Messiah (a.s.). The schools, colleges and hospitals we have established and are running, have all been built as a means of fulfilling that overriding objective of having our worship accepted by God. To give just one example, the Ahmadiyya Community is providing clean drinking water in some of the most remote parts of Africa and certain other poor countries and we are doing so only as a means to seek the pleasure of God Almighty. It is due to the love and compassion we have in our hearts for all of mankind that the Ahmadiyya Community constantly draws the attention of world leaders towards establishing peace and justice at all levels. We make such efforts because we want to save mankind from destruction and therefore we advocate justice, – because it is the only route to peace. The Holy Qur’an has not only explained the need for justice, but has also explained the standards of justice that are required. It says that the enmity of any nation or people should not lead a person to act otherwise than with justice or fairness. It is absolutely against Islam’s teachings to discard justice for the sake of furthering personal or vested interests or as a means of revenge. History bears witness to the fact that the Holy Prophet Muhammad (s.a) fulfilled the requirements of justice by making a decision in favour of a Jewish person and against a Muslim. The Holy Prophet (s.a) did so because his understanding of the Qur’an was unparalleled, as was the way in which he fulfilled the rights of worship. Thus, I say once again, that the worshippers who enter this mosque, will not only bow down before God, but will be they who fulfill the rights of God’s creation. All of the people who enter this mosque will be completely law-abiding. All of the people who enter this mosque will have a genuine and absolute love for this country and will believe that this love for their nation is an essential part of their faith. All of the people who enter this mosque will be those who fulfill the rights of their neighbours, rather than cause them any harm or discomfort. Indeed, Islam stresses the rights of neighbours to such a degree that the Holy Prophet Muhammad (s.a) once said that God Almighty had emphasised the rights of one’s neighbours to him so emphatically that he thought that perhaps they would be included amongst a person’s inheritors. And so, what magnificent teachings we have been given to establish love and brotherhood within a society. All those who enter this mosque will be people who fulfill the rights of God and His Creation. Any person who enters this mosque with anything other than this teaching or intention, is not a true Muslim; rather, he would be defaming the name of Islam. And so this mosque will not only be known as a “place of worship,” but will also become known as an outstanding symbol of love, brotherhood and compassion. At the end, I would like to speak very briefly about the current state of the world. It is my hope and my prayer that the people of this nation, and indeed the wider world, work towards removing all types of fears or anxieties that exist within their societies. I also pray that all governments fulfil the rights of justice and become those who establish peace in the world. Otherwise, there is little doubt that the world is rapidly heading towards disaster, as a devastating world war seems to draw ever closer. If we fail to stop it in its tracks, we will have to face the most horrific consequences of a global war in which nuclear weapons will more than likely be used, causing nothing but carnage and devastation for decades to come. Our future generations will never forgive us if we allow such a catastrophe to occur. To save the world from such horrors, the people and government of Australia should also fulfil their responsibilities and play their respective roles. May Allah grant them the capability to do so.